14 "Hang Together—Or Hang Separately"
Kurt Alan Stand, then 42, a regional labor union representative along with his wife, Theresa Squillacote (39), a former senior staff lawyer in the office of the Deputy Under Secretary of Defense, and friend James Clark (49), a private investigator, were arrested 4 Oct 1997 on charges of spying for East Germany and Russia. Kurt Stand is now married to Lisa Foley Stand . He was released from prison in 2012. He now works at Busboys and Poets. Kurt Stand and Theresa Squillacote are the parents of Karl Stand, and Rosa Squillacote. From a 2018 Portside bio of Kurt Stand. Kurt Stand was for many years part of the trade union movement as a rank-and-file member, staff worker and officer. This includes service as the elected North American Regional Secretary of the Geneva-based International Union of Food and Allied Workers. 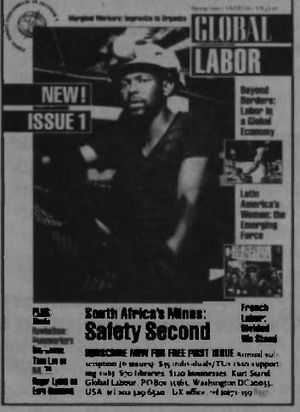 During the 1980s he was active in the DC-area local Rainbow labor committee, in labor anti-apartheid campaigns, in El Salvador and Guatemalan labor solidarity committees and in the DSA national labor commission. An active member of socialist organizations, including the YWLL in the 1970s, he joined DSA in 1983 and served in its local and national leadership up through 1997. From 1997 through 2012, Stand was imprisoned on national security/espionage charges because of his support for the German Democratic Republic. Since his return home he has become active in Progressive Cheverly (in Maryland), and in the Metro DC DSA. He serves on the steering committee of DC Jobs with Justice and is a participant in the National Homecomers Academy (a local DC organization of community activists comprised of people returning home from prison). Kurt Stand, inspired by his family's beliefs was politically active from his teens-defending Angela Davis and Philip Berrigan and Daniel Berrigan and joining the the Communist Party USA youth wing, the Young Workers Liberation League. Entering high school, I acted on my beliefs—participating in the peace movement and in defense of such imprisoned activists as Angela Davis and Phillip and Daniel Berrigan, joining in local New York City battles for rent control and welfare rights and in support actions for striking postal workers and the United Farm Workers grape boycott. I also took part in events on behalf of movements for social justice abroad, be it for civil rights in Northern Ireland, on behalf of Puerto Rican independence, against the economic and cultural blockade of Cuba, or in opposition to South African apartheid. During this time I came into contact with a wide variety of left-wing and socialist groups which led me to join, in 1970, the Young Workers League (YWLL), a communist youth organization. I hoped that this would provide a context for my political activities and my studies, a way to understand how all these various events, which at times seemed at cross purposes, were somehow connected. And the best part of YWLL was when we tried to make a connection visible to those who would deny it; as when we handed out anti-war literature at construction sites across the city shortly after workers clashed with street demonstrators. I did not see the communist movement as an end in itself, capable of answering all questions, but I did feel it provided a way to discuss where all this activity was leading; a way to be not just against, but also for something. In 2013, Kurt Stand was listed a a friend on the DuBois Clubs Facebook page. In 1973, during his freshman year, Kurt Stand was campus chairman of the Young Workers Liberation League, the youth arm of the Communist Party USA. His friend and later espionage colleague James Clark became chairman in 1974. Kurt Stand began his spying activities in 1972 after being recruited by East Germany to cultivate other spies in the Washington, DC, area. He was introduced to East German intelligence officers (the Stasi) through his father, Maxmillian, or Mille Stand, a chemical engineer who fled Nazi Germany in the 1930s. An FBI affidavit said East Germany's relationship with the Stand family goes back to Stand's father, who recruited his son as a communist agent. In a secretly recorded conversation, Squillacote said the family relationship was even deeper. ``Between my husband and myself we go back in this work to 1918,'' she told an undercover FBI agent, according to the affidavit. Clark, Squillacote, and Stand attended the University of Wisconsin in the 1970s where they were affiliated with the Progressive Student Forum and the Young Workers Liberation League, the youth arm of the Communist Party USA. Stand recruited Clark in 1976 and Squillacote about the time the couple was married in 1980. Before obtaining a position at the Pentagon, Theresa Squillacote was employed by the National Labor Relations Board and, later, the House Armed Services Committee. She sent numerous photographs to her German handlers. Squillacote told an undercover FBI agent that she turned to spying to support the progressive anti-imperialist movement. She first came to the attention of the FBI in 1995 when she offered to be a spy in a letter to a South African government Minister who was a leader of the South African Communist Party. Stand and Squillacote frequently traveled to Mexico, Germany, and Canada during which time Stand would meet with their East German handlers. When the two Germanys united in 1990, Stand’s controllers tried to recruit him to spy for the Soviet Union and then for the Russian Federation. Although he never gained access to classified material, his role in the operation was to recruit agents and to provide information about the non-governmental groups with which he worked. Stand allegedly received $24,650 for his recruiting and coordinating efforts. On 23 Oct 1998, he and Squillacote were convicted of conspiracy to commit espionage, attempted espionage, and illegally obtaining national defense documents. On 22 Jan 1999, a U.S. District Judge sentenced Squillacote to 21 years and 10 months in prison and Stand to a sentence of 17 years and six months. Stand joined Democratic Socialists of America shortly after the Democratic Socialist Organizing Committee-New American Movement merger in 1982. In 1983 Kurt Stand was a District of Columbia, Maryland delegate to the Democratic Socialists of America conference in New York City, October 14-16, 1983. Those helping prepare the Spring 1988 edition of The Rainbow Organizer included Jack O'Dell, Dorma Lippincott, Patricia McGurk, Frances Williams, Jorge Belgave, Ileana Matamoros, Mary Parks, Sabrina Clay. Special thanks for helping with this issue were extended to Dennis Desmond, Clarence Lusane and Kurt Stand. Photos Patrick Dreason and Greg Smith. Elaine Bernard; Arthur Lipow, Michael Harrington Center; Kurt Stand, Democratic Socialists of America and Judy Page, New Party were speakers on the Towards a New Party panel sponsored by the Democratic Socialists of America at the Tenth Annual Socialist Scholars Conference. The conference was held April 24-26, 1992 at the Borough of Manhattan Community College, New York City. In 1992 Kurt Stand was a member of the Democratic Socialists of America Racial Diversity Task Force - charged with finding ways of recruiting (and retaining) more "people of color" into the organization. In 1993 Kurt Stand was a co-editor of Global Labor and a member of the DSA National Political Committee. In 1994 Kurt Stand of Washington, D.C. was a member of the Democratic Socialists of America Steering Committee. In 1995 Kurt Stand wrote an article for Democratic Socialists of America's Democratic Left, March/April edition, "Hang Together—Or Hang Separately, Democracy's Future in a Global Economy", taking a strong anti free trade line. The American, French, and Haitian revolutions two hundred years ago limited the first wave of world expansion and established an international concept of citizenship as a challenge to rulers who saw the world as their personal domain. Today, the internationalism of those who see the world as their plaything must again be challenged by an internationalism rooted in our common rights as human beings. At the time he was a member of the DSA National Political Committee, and North American Regional Director of the International Union of Food, Agricultural, Hotel, Restaurant, Catering, Tobacco and Allied Workers' Association. Kurt Stand ran again for NPC in 1995. All three co-conspirators in the Stand case were former members of the Young Workers Liberation League. Kurt Stand's father Mille Stand was a long standing member of the Communist Party USA. Kurt Stand was a leader of Democratic Socialists of America at the time of his arrest. Kurt Stand, Theresa Squillacote and Mille Stand were all members of the Communist Party USA splinter group, Committees of Correspondence. In June 2008 Kurt stand wrote an essay in prison entitled Supporting "Barack Obama: A Prison-Eye View of the Presidential Campaign "
To go back to Obama, nobody knows what he will do, but if he is able to overcome our country’s racism and actually win election we can expect some initial efforts to rein in the excesses of the Bush Administration, some measures to ameliorate the worst conditions which people are experiencing in terms of rights, in terms of insecurity. For his corporate supporters that will be enough, for most of those voting for him it will be sufficient only as a first step. It will be up to those who want genuine social justice to build movements that give him the possibility of pushing further; finding out then whether he will or won’t remembering that the key will not be him but us (us defined as those who worked for his election, for social justice activists, the left) and what we do, how we organize. How we use the social solidarity the campaign is developing as the basis of a renewed social solidarity. Will that be enough—no, the structural roots of the wars in Iraq/Afghanistan, of neo-liberal economics, of the authoritarian aspects of our political culture won’t go gently in the night. Only, however, by working in good faith with attempts to improve what is, is it even possible to imagine the building of the necessary, broad-based, independent, radical formations able to press for deeper changes. In sum, radicals and progressives ought to join those—including those in prison—who have already decided to back Obama, see where the campaign can take us, see what can then be accomplished. Kurt stand is now the partner of fellow activist Lisa Foley. By 2013, Kurt Stand was an active member of the Metro Washington DC Democratic Socialists of America. 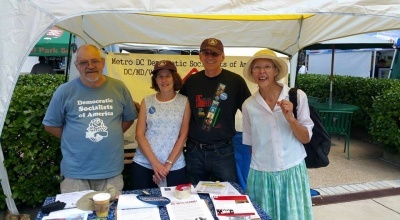 Democratic Socialists of America members were at Greenbelt Labor Day Festival, 2015, canvassing for DSA and Bernie Sanders. They were Woody Woodruff, Lisa Foley Stand, Kurt Stand and Lucy Duff. Toward Radical Democracy was a 2018 "Proposal for Internal Voting Reform in Boston DSA". If you would like to sign on in support of this proposal, please click here. To date, over 100 members of Boston DSA have endorsed it. We also welcome support from DSA comrades in other chapters. Signatories also included non Boston comrades such as Kurt Stand. This page was last modified on 24 February 2019, at 04:59.